Unlike other plugs which are completely tapered, our plug is slightly tapered 5 degrees. 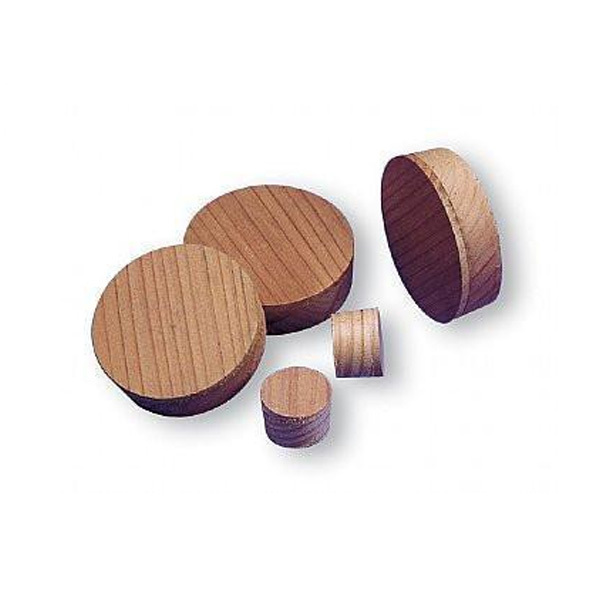 Our 3/4″ thick plugs are slightly oversized on the top making for a tight fit. All are made from kiln dried lumber and are produced on specially designed equipment, resulting in quality, uniformly-sized plugs. Our plugs feature a unique advantage. These plugs are pre-counted and packaged in net bags, eliminating extra handling in further distribution and inventory control. 1", 1 1/16", 1 1/8", 1 1/4", 1 1/2", 2", 2 1/16", 2 1/8", 2 1/4", 2 1/2", 2 9/16", 3"